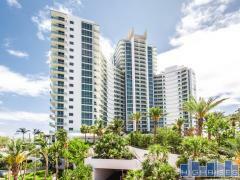 The Biscayne Beach Residences are located in a towering 51 story high-rise in Miami's East Edgewater neighborhood. Amenities include a private beach, cabanas, pool, dog park, and basketball and tennis courts. Have any comments or questions about Biscayne Beach Residences? Ask your question and/or share your thoughts about this Building.